The funeral for K was on Saturday. A gathering of the choir that had been singing for her took place Sunday. 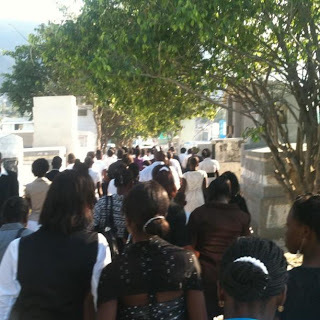 Funerals in Haiti are fairly intense and culturally the way grief is expressed looks different than what we're used to ...We've only been to three funerals in our time here. This weekend brought big changes to our 2012 outlook ... a bunch of family and friends in MN were able to find great airfares to come see us. We now have family coming in March, May, and July and friends coming in June and December. We haven't had this many visitors since our first year here! The three musketeers got matching baseball jersey shirts and decided to all wear them to school today, they posed for photos as they headed out this morning. It has been such a great few weeks of school with the kids coming home excited every day and eager to go each morning. We're very pumped for Jimmy and Becky's baby to come. We're all guessing it is a boy. The dogs have to be all up in our mix anytime it is possible. This guarantees that we have a white spot of dog snot on our upper thigh most days. Delicious. Hazelnut won't be one year old until May but is looking like she'll be a bigger dog than Peanut once she's full grown. Peanut is the best Mastiff of all seven of the current Heartline Mastiffs (in our opinion) - She has totally perfected security detail and knows exactly when to bark and act tough and when to zip it. We've had Peanut since early 2006 and even as a non-dog person I am forced to admit I love that animal. Hazel needs to get a lot smarter and a lot less 'sou moun' before I'll ever claim to love her.